Hey there friends! I have a new layout to share with you today that was recently on The Cut Shoppe Blog. I used The Everyday Essentials Cut File and The You’ve Been Punc’d Cut File for this layout documenting a self portrait drawing my son had made. I used clear gesso and a yellow watercolor from the Prima Tropicals Watercolor Confections to add a little color behind the photo. Around the photo, I used multiple embellishments from the Crate Paper Cool Kid Collection and a few other odds and ends from my stash. I used a retired stamp set from Close To My Heart and a light blue dye ink to add more interest behind the photo. I’m really trying to add more stamping to my layouts. I have so many and they are so neglected! HA! I’ve found that I’m much more opt to add stamping to my layouts when I use the Tim Holtz Tonic Studios Stamp Platform. It feels less daring when I know I can perfectly position the stamp set a second time in case I don’t get a clean impression the first time. I cut a star and an ampersand from the Cool Kid 6×6 Paper Pad using The Everyday Essentials Cut File, and I positioned those cut files around the photo for additional die cut embellishments. I used the Thickers set from the Cool Kid Collection for my title, Don’t Grow Up. That’s something I love about cut files…they can be cut large to use as focal images or they can be sized down to use as embellishments! I layered multiple manufacturing strips from the Cool Kid 6×6 Paper Pad and used my mini stapler to attach them to the top and bottom of the layout. I then created a cluster along the bottom strips of paper. I used another star from The Everyday Essentials Cut File, two icons from The You’ve Been Punc’d Cut File, and a few other stickers from the Cool Kid Collection. I just wanted to add one line of journaling for my photo, so I grabbed the label sticker at the bottom of the layout and used my We R Memory Keepers Typecast Typewriter to add the journaling. This sticker had a slick surface so the ink from the typewriter was wanting to smudge. To try to prevent the smudging, I used a permanent ink pen from American Crafts to trace over the journaling. That worked like a charm!! I wanted to add another pop of black to the background so I grabbed an Illustrated Faith Stamp Set to add little doodle accents around the page. Now the layout feels done! This layout took a lot of twists and turns. It also had a few mixed media disasters, but I persevered and am really happy with the finished layout! To see how this layout came together, including all the blunders, you can watch the process video. 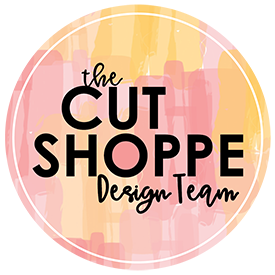 Remember to head to The Cut Shoppe Etsy Store to check out all of the cut files. New cut files are added every 2 weeks, but there are so many fun designs that never go out of style! Yep, this is too cute! I’ve always loved this collection!